The ground grows green. It is covered in most parts with growing things that filter pollution from the air, create breezes and cooling effects, absorb rainwater and create a natural habitat for wildlife and insects. In the 21st century, continued development of urban areas requires an intensified commitment to the environment. Green Roofs are a social and economical investment in an improved relationship with nature. Beautiful in every season, roof top gardens are a pleasant reprieve from blacktop surfaces filled with heating and cooling units. A Green Roof is a good neighbor and a native habitat oasis. One of the Seven Wonders of the World was the Hanging Gardens of Babylon. Green Roofs add beauty to our cities, lower the air temperature, improve air quality for everyone, lower energy bills, extend the life of a roof and reduce urban heat island effects. Imagine an urban oasis! Activity 1 – Build a Green Roof! How many flat roofs does your neighborhood have? This is your chance to propose a new design for a green roof! Open up Google Earth and look at the roof top views of all of the flat buildings in your neighborhood. Choose a building that you know, one you walk by every day. Zoom into your neighborhood until your rooftop fills the page then print your roof in black and white. Next, check out the green roof explore resources. Look at the many plants that can grow on a green roof. Using colored paper, cut up magazines for texture or photos of plants and create a green roof design. The green roof will be an intensive green roof (meaning that it will need to be watered and tended). Design paths and places for people to sit; if there is a room on your roof, include a green house or hoop house. A small green house is 10 x 12; a larger green house is 12’ x 24’. Use colored paper, and textures from magazines or colored markers/watercolor to create different plant areas. Green your roof! The Hanging garden of Babylon was one of the seven ancient wonders of the world. Was it a green roof? Be a wonder wizard and check out the seven ancient and seven natural wonders of the world. List the fourteen wonders and make a drawing of what you think the Hanging Garden of Babylon looked like. Where would you like to see a green roof? Look around your neighborhood or your city. Check out roof tops on Google Earth. Pick a roof top and design a green roof. First select whether your green roof is going to be intensive or extensive. Use at least five different species of plants including ground covers. Design your walkways or paths. Color or shade the different areas of plants. Where would you like to see a green roof? Look around your neighborhood or your city. Check out roof tops on Google Earth. Pick a roof top and design a green roof. First select whether your green roof is going to be intensive or extensive. Use at least five different species of plants, including ground covers. Design your walkways or paths. Color or shade the different areas of plants. Research on the web how to build a green roof. Copy this drawing of seven layers in your journal. Color each layer and label neatly. 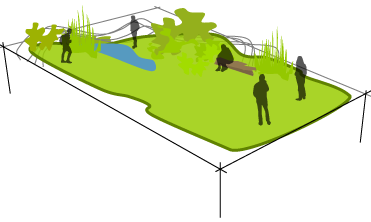 Show your drawing to someone and write a paragraph to explain the benefits of a green roof. 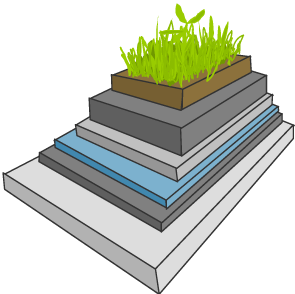 The structure of the roof needs to be able to support a green roof. 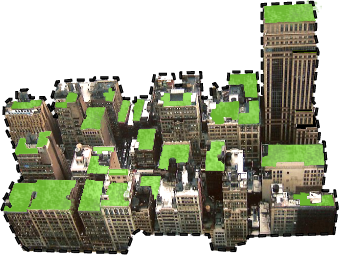 Green roofs weigh between 15 and 150 pounds per square foot. Green roofs extend the life of a roof 2 - 3 times. Green Roofs don't always require soil. Sedum is a low maintenance drought resistant ground cover.